Escoda's Series 7040 brush is a full-bodied, filbert bristle brush for murals, decorative work, and faux finishing. 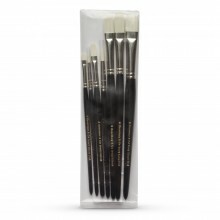 It tapers to a soft, rounded tip and provides excellent control, for a bristle brush. This brush has a long handle made of unvarnished wood.